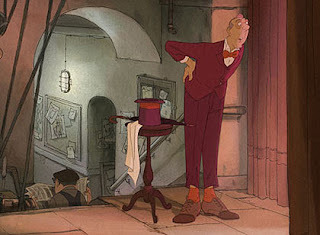 A heart-warming animated tale that had been collecting dust for a half-century, Sylvain Chomet returns long-dead film legend Jacques Tati to the cinema in "The Illusionist". Tati and writing partner Henri Marquet ("Mr. Hulot's Holiday", "The Big Day") had collaborated in 1956 on the story of an erstwhile great magician and a young girl tagging along around Europe. The script was intended as a personal letter to Tati's abandoned daughter Helga but circumstances, shame and the immense production of "Playtime" scuppered the film. Years later Chomet, with the success of "The Triplets of Belleville," was handed the idea by Tati's family (thankfully we'd been saved the live-action sight of Roberto Benigni or Steve Martin as Tati's great creation-the stiff, bumbling galoot that is Monsieur Hulot in magician's robes). What follows is standard for Tati's body of work; non-existent dialogue, an anachronistic character at odds with changing times with little bits of visual humour throughout. The setting was originally meant for 1950's Czechoslovakia but Chomet fell in love with Edinburgh's stones and fog and rain (having been there I'll emphasize it: tons of rain) and wisely moved the story there, it has the mystique of an animated world. "The Illusionist" doesn't try to overwhelm with emotion and laughter like Disney's work but the breezy charm may win you over. Don't regard it as highly as Chomet's 2003 surreal spectacular "Belleville", but as a muted little film in comparison, and I might be too forgiving with my rating, but every time we see the cartoon Tati/Hulot created by lead animator Laurent Kircher on screen my heart grew three times it's size. What can I say, I'm just a big softy when it comes to Tati and Chomet. Take your kids. By the sounds of things it would appear that Chomet is being incredibly spiteful towards Tati's abandoned daughter who he had originally wrote the script for, Helga Marie-Jeanne. Surely the movie would be a lot richer by acknowledging the very sad true story of the child who must have suffered greatly for her father’s mistreatment. The review’s I’ve read from the Berlin screening say that Chomet’s adaptation is very sad but with no explanation as to why. I wanted to acknowledge the importance of Helga in my review so she got a mention, bizarre Chomet didn't do the same in the credits. As for the issue of sadness, the film is melancholy as is common in Chomet and Tati's work but because "The Illusionist" was done so well it didn't faze me in the slightest-the joy of its result is growing on me more and more. Make sure to stay for the last credits when you see it.